The proud history makes Yuneng top supplier in oil purification field in China. On site staff training for installation and operation of the machine is available. 3) If you need us to send our engineer to service oversea, please contact us for more details. The tank body has interlayer and heat-insulating layer (for heating, cooling or heat insulating). It has no sanitary dead corner and its wholly enclosed design ensures that materials are always mixted and ferment at no-pollution state. 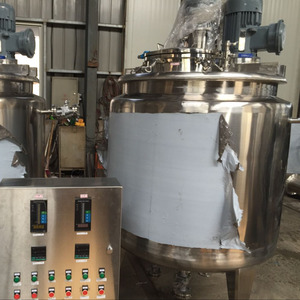 paint mixing machine The fermentation process of pharmacy, fine chemical engineering and biological products is aseptic and untainted. insulation layer: PU Foam as to the thickness, we can make it according to your requirement. 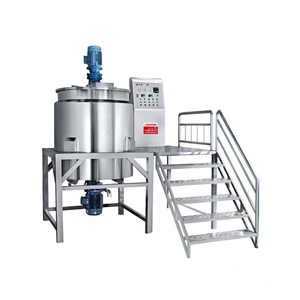 8)Vertical blender (paddle type or fame type are available if customer require). 10)Liquid level meter and level controller (according to customer requirements). 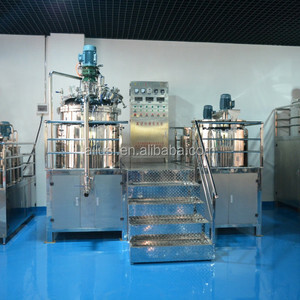 Shanghai ELE Mechanical And Electrical Equipment Co., Ltd.
Wuxi Zhongwang Automation Technology Co., Ltd.
cosmetics cream making machine, blending tank, oil mixing tank (Alibaba trade assurance and TOP supplier) cosmetics cream making machine are widely applied in the beverage, food, dairy, pharmaceutical, chemical and process industries used as blending tank, buffer tank, melting tank, high shear mixing tank and emulsifying tank, which cleanable to sanitary standards . Product Features: 1) Material: SUS304/ SUS 316L 2) Layer: Single layer/ double layers/ three layers 3) Power: 0.55~55KW 4) Capacity: 100L~20,000L 5) Voltage: 110V~ 480V, can be customized 6) Heating Type: electric/ steam heating 7) Polish: mirror polish inside and outside Factory Scale: 1) Located in: Zhejiang, China 2) Factory Area: 5000SQ. M 3) Employees: 37 4) Production Ability: 100 Pieces/M jacketed tank Advantages: 1) Certificates: CE ,ISO, 3A 2) Warranty: 12 months 3) OEM/ODM: can design, exploitation and manufacture by CAD software and drawing. 3. Q:What's the delivery time9 A: It will take about 25 workdays to finish an order, but the exact time is according to actual situation. 4. Q: Can I have my own customized product9 A: Of course, you products can be customed for example color, logo, design, mark, etc. 5. 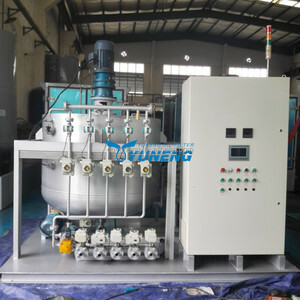 Q: Do you have quality control of oil mixing machine 9 A: Yes, we attach great importance to quality control for oil mixing machine . 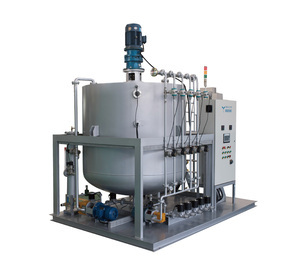 Jiangsu Zonre Mechanical Equipment Co., Ltd.
Wuxi YK Automation Technology Co., Ltd.
Alibaba.com offers 706 oil blending equipment products. About 43% of these are mixing equipment, 2% are essential oil. 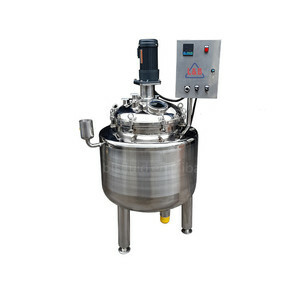 A wide variety of oil blending equipment options are available to you, such as agitator, homogenizer, and screw. You can also choose from viscous fluid, liquid, and liquid with suspended solids. 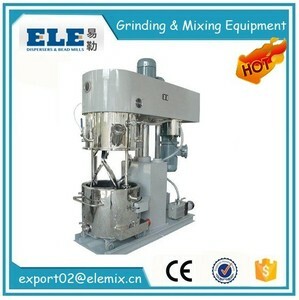 As well as from granulating, milling, and coating. And whether oil blending equipment is paid samples. 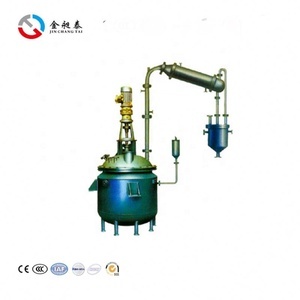 There are 701 oil blending equipment suppliers, mainly located in Asia. The top supplying countries are China (Mainland), India, and United Kingdom, which supply 99%, 1%, and 1% of oil blending equipment respectively. 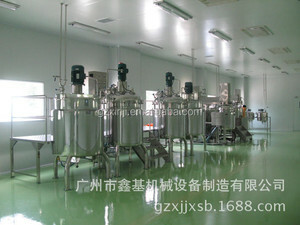 Oil blending equipment products are most popular in Domestic Market, Southeast Asia, and Africa. You can ensure product safety by selecting from certified suppliers, including 184 with Other, 174 with ISO9001, and 4 with ISO14001 certification.